Continuing his tirade against Prime Minister Modi, Congress leader Rahul Gandhi asked whether it was wrong to go to a temple. AHMEDABAD: Rahul Gandhi backed Manmohan Singh saying he will not use foul language to criticise PM Modi but his comments against the former PM were unacceptable. “Modiji says a lot of things about me but I will not use foul language to criticise him. 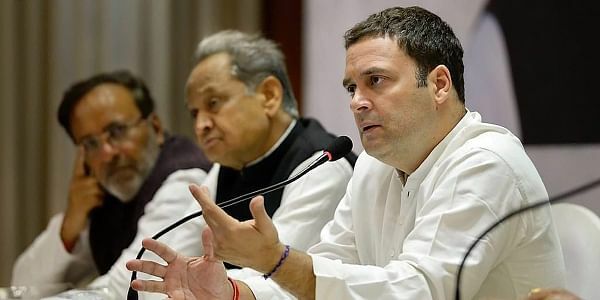 But his comments against the former PM are unacceptable,” Congress president-elect Rahul Gandhi said in Ahmedabad on a day he wrapped up the Gujarat poll campaign and addressed a press conference. The Congress leader was referring to Modi’s charge that Singh along with some Pakistani officials had meddled in the Gujarat polls. The comment had invited an angry response from Singh who asked Modi to apologise. Rahul also took a dig at Modi’s anti-corruption stance, saying he delayed the parliament’s winter session to avoid a debate on the charges against Jay Shah, son of BJP’s chief Amit Shah. The press conference was arranged as the local authorities denied permission for Rahul’s roadshow in the state capital. Party sources said the comment coming a day after Rahul was named party president was significant as outgoing chief Sonia Gandhi had always held Manmohan Singh in high esteem ever since she named him the party’s prime minister in 2004 and again in 2009 as Rahul was being groomed. Rahul, who as party vice president had publicly torn an ordinance to save tainted politicians being pushed by Manmohan Singh’s cabinet in 2013, also seems to be appreciating the talent of the former prime minister as he deployed Singh thrice during the Gujarat campaign, twice to attack PM Modi’s demonetisation and GST decisions and tap the unrest among the traders in Gujarat and once to wean away the urban voters from the BJP. Coming from a former prime minister, who is also a well-known economist, Rahul’s strategists thought Singh’s views on Modi’s economic policies and would add weight to the party’s campaign in the tightly contested polls. On his part, Singh had described Rahul as darling of the Congress workers on December 4 when the Gandhi scion filed the only nomination for the post of the Congress president. Rahul claimed the Congress would win the polls and the results on December 18 would be stunning. Outlining his vision for the party, he said strengthening the organisation and spreading its ideology across the country would be his priorities as the new party chief.